TRICKY: it's his party and he'll be trying if he wants to. Forced to cancel a recent festival date in Ireland after breaking a leg, Tricky must now be in mortal danger of breaking his neck judging by the manic physical performance he’s giving on the opening night of his latest UK tour. The spliff-wielding, stone-still performer of old has been replaced by a frantic figure whose monotone vocals are delivered from a mouth being whipped from side to side so quickly (Tricky’s body, meanwhile, wriggling and jerking like a fish on a hook) it seems impossible that, even if his spine survives the punishment, his head and shoulders won't escape a severe bruising. But tonight, such value-for-money visual theatrics take a while to develop. The start of the show is a shambolic, inauspicious affair, Tricky, Martine and various session musicians ambling on stage, standing around a while for the apparent want of anything better to do, before finally lurching into a song which the dense sludge of sound coming from the PA renders incomprehensible. It takes two or three more similarly impenetrable efforts, at least one false start and Tricky’s first audible utterance of the night (“Can I have some more volume in my bass, please?") for the show to warm up and the not—quite-full auditorium to cease murmuring its discontent. What eventually develops is a set with a clearly split personality. 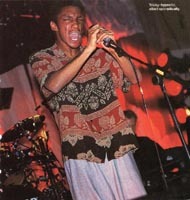 Singing the pick of the songs from Tricky’s first album, 1995's Maxinquaye, cohort Martine is allowed space to develop a series of slow-burning, seductive grooves, her smoky vocal reaching out from a stage more often than not plunged into near total darkness by the sixth form disco—style lighting rig. show has begun to make a kind of strange, mesmeric sense. salvaged by virtue of Tricky’s sheer persistence, the demons scurrying around in his head at last becoming vivid — if only to those prepared to make the effort to be drawn in by them.